The messiest room in the house is probably also the one your family uses most regularly–the bathroom! From half-empty hair products to old medicine, bathrooms tend to collect a lot of clutter. Since it’s so small, all that clutter builds up quickly! Here are some tips to declutter your bathroom, and reorganize it to prevent further disasters. Get Rid of Junk! First things first: go through all the items in your bathroom and make sure you actually use them. Check makeup, nail polish, shampoo and conditioner bottles, medicines, linens, towels, shaving supplies, and even the scary places under the sink. Mr. Junk can pick up all your bathroom clutter and donate, recycle, or throw it away. Everything in Its Place. Once you’ve pared down to only the things you need, make sure everything has a place. The less you store on the counter, the better. Assign each member of the family a drawer. If you don’t have enough drawer space for everyone to have their own, a gallon-size plastic baggie will help contain each person’s items. Stop Problems Before They Start. Do you find lots of dirty clothes on the bathroom floor? Move a hamper inside and put it where the clothes land! A lot of packaging from bathroom items can be recycled–consider adding a recycling bin next to your bathroom trash can. Put everyday items like soap and toothpaste in easy reach, and look for creative storage solutions like pencil cases for makeup or coffee mugs for toothbrushes. 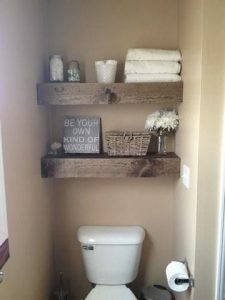 When you’re finished decluttering your bathroom (or any space), call Mr. Junk in metro Atlanta for efficient, courteous, affordable junk removal!